We're sorry to say that the January 14th Brown in the South Supper Series is SOLD OUT. Click here to sign-up for our e-newsletter - we'll keep ya up to date about future Brown in the South Supper Series! 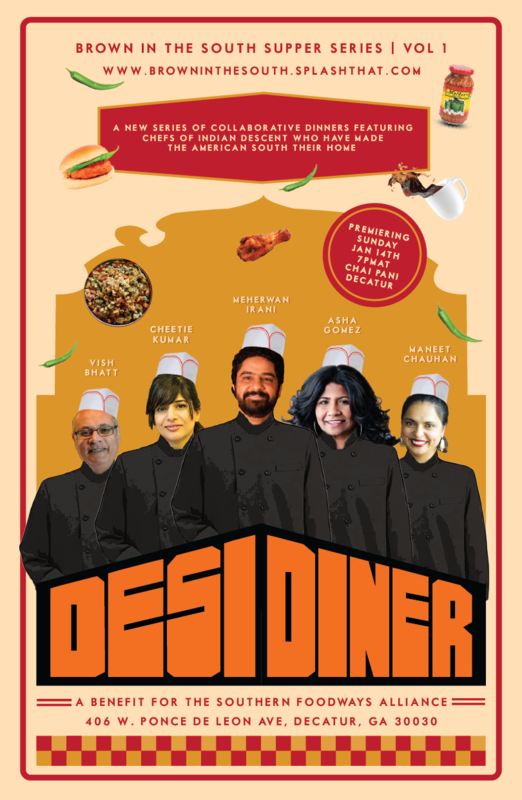 The first of a new collaborative dinner series, Brown in the South, featuring celebrated Indian Chefs who live and cook in the American south. A benefit for the Southern Foodways Alliance. They're all Brown in the South! “Brown in The South Supper Series” is a new series of collaborative dinners featuring chefs of Indian descent who have made the South their home. These dinners will showcase the culture, culinary heritage, and cooking styles of these celebrated chefs, while keeping the focus on southern ingredients and uniquely southern themes. The Southern Foodways Alliance documents, studies, and explores the diverse food cultures of the changing American South. Their work sets a welcome table where all may consider our history and our future in a spirit of respect and reconciliation. We're sorry, but we cannot guarantee accommodations of dietary restrictions. We cannot guarantee that we will be able to meet dietary requirements during this Supper Series.